With thousands of caravanners enjoying the great British staycation, not every trip will be trouble free. All kinds of caravan accidents do happen and more so when the camping season is in full swing. 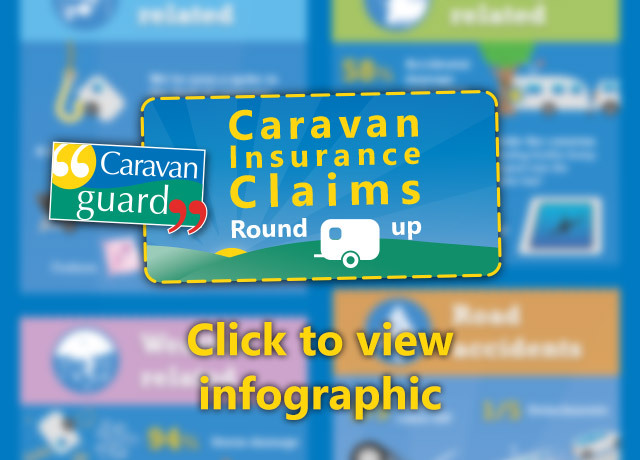 So we’ve delved into our records to give you an insight into the most common caravan insurance claims we’ve dealt with over the last few months. Our top two types of claims are for accidental damage or due to the unpredictable British weather – all the more reason to make sure you insure your caravan against the unexpected or those accidental mishaps. We also take a look at how many theft and road accident claims we’ve seen since March 2016. Click the image below to view our full infographic, then don’t forget to read below to see how you can minimise your chances of suffering a caravanning mishap. The most common claims over the last few months have been for damage related incidents. Towing and manoeuvring a caravan into narrow or small spaces can prove difficult to even the most experienced of caravanners, especially when there’s been a long journey to get to your destination. It’s not surprising then that more than half of damage related claims were caused by policyholders hitting trees, walls or posts whilst manoeuvring their caravan. These kind of incidents happen at home, on site or when owners are moving their caravan in or out of storage. 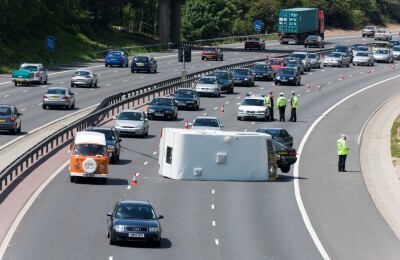 How can you prevent caravan manoeuvring mishaps? Many of our readers tell us a motor mover can can help to manoeuvre your caravan into the tightest of spaces, trouble-free. Also check out our guide on reversing like a pro. 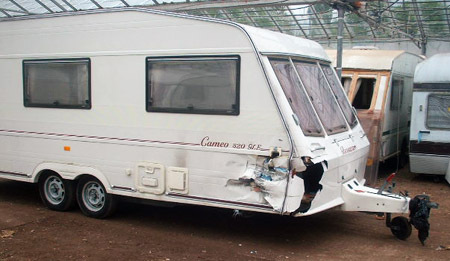 Not many owners have them but it’s possible to buy caravan reversing cameras or sensors that can help to reduce the likelihood of this kind of damage and will get you a 5% discount on your caravan insurance. As a large area of the caravan is made up of windows they tend to suffer damage from stones flying up when towing, birds flying into them, or falling debris such as tree branches when in storage. How can you prevent caravan window damage? A caravan towing cover will add an extra layer of protection to the front window when towing, and when in storage a caravan cover can offer protection from falling branches and anything else high winds might throw at it. A small amount of claims were for damage inside the caravan, such as cracked shower trays, dented worktops, smashed oven doors or spilt liquids. How can you prevent internal surface damage? Be careful with shampoo bottles when showering and make sure bottles, jars and other heavy objects are secure in your caravan’s cupboards and storage areas during transit, so they don’t fall on to internal surfaces like glass cooker hob covers, kitchen worktops and shower trays. We love to talk about the British weather and how unpredictable it can be. When it comes to caravanning, the weather accounts for nearly a quarter of our claims. 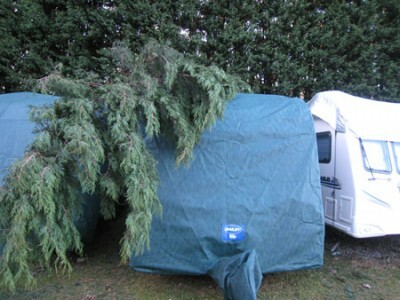 Storms are the biggest cause of damage to caravans and awnings. It’s therefore important to make sure you’ve insured your awning for the correct value and that your insurance policy does include storm cover for caravan awnings. Roof lights often bear the brunt of storms and in the last three months we’ve dealt with several reports of hailstone damage. Whilst these claims have been relatively infrequent in 2016, they can often be widespread, such as in 2012 when 71 of our policyholders had their caravans damaged by hailstorms in one day. It does again highlight the importance of making sure you have caravan insurance cover all-year-round should your caravan be hit by storms, strong winds or even flooding. How can you prepare for the weather? Of course the weather is very hard to predict and therefore such caravan damage is very often unavoidable. It’s always worth checking the weather forecast before towing and taking extra care driving in bad weather. If you’re staying on a touring park near a river and you know heavy rain is on the way then check the Environment Agency’s flood warning website and move your caravan to a pitch on higher ground if possible. Take down awnings if high winds are forecast and if on a seasonal pitch use awning straps to keep it securely fastened. We often deal with claims for damage to caravan panels caused by awning poles or where the awning has ripped during stormy weather. Whilst still one of our least common claims, over recent months we’ve seen a small spike in theft of caravans, so it’s always worth thinking about extra security. Almost a third of theft claims were for theft of equipment, where thieves have taken all kinds of things from barbecues to gas cylinders, cushions and even a toilet cassette! How do you prevent theft? Theft protection devices can not only help to prevent someone stealing your pride and joy but will also help reduce your caravan insurance premium. Here at Caravan Guard we offer a range of insurance discounts for tracking devices, alarms, secure storage, VIN Chip Plus and other security marking products. Stay security conscious, always using your hitchlock and wheelclamps or axle wheel locks, and do think about fitting extra security. Make sure you do activate alarms and tracking devices, if you have them, and every time you leave the caravan unattended. Keep valuables locked away and out of sight and always close and lock caravan windows and doors when you go off for the day. Between March and August, you’ll be pleased to know less than 10% of customer claims were for road accidents. A third of these were where wheels have come off the caravan and a fifth occurred after the caravan had detached itself from the towing vehicle. Tyre blow outs also accounted for a fifth of road accident claims also– as did jack-knifing, which is sometimes as a result of tyre problems. How do I reduce the chance of a road accident? As well as making sure you load your caravan properly, it’s important you have your caravan serviced annually to spot for any signs of wear and tear or loose fittings. Make sure you check the tightness of your caravan wheel nuts regularly and if you don’t already have them, consider fitting some high performance wheel bolts such as WSL safety bolts to reduce the chances of loosening and wheels falling off. Always make sure your caravan is properly attached to your tow car and that the breakaway cable is in good condition and has been correctly fitted before every journey. You should always check your caravan and tow vehicle’s tyres before you set off and consider investing in a tyre pressure monitoring system so you can monitor tyre pressures and temperatures whilst on the move. We offer a five per cent insurance discount for fitting such a system to your caravan, and Tyrepal will give our readers 5% off their TPMS product using the discount code GUARDTP1 until March 2017. Tyron safety bands can also help you come to a safe stop and reduce damage in the event of a blowout. So if you’re off touring this coming Bank Holiday or later in the caravanning season always take those extra precautions whether it be when towing, moving your caravan in and out of storage, loading before transit, staying security conscious or keeping an eye on the weather! Have you ever had to make a caravan claim? Do you have any other tips for safe and secure touring? Feel free to share your stories in the comments box below. I experienced only last week on the M1, violent jack-knifing whilst avoiding a car turning into my lane while I was overtaking an h g v. The car concerned was turning into my lane, I assume not realising I was entering the same lane. I had to swerve to miss her and brake to miss the hgv. I could feel my Volvo being lifted. I am very grateful for Alko anti-sway system. Thank you Bailey. Sounds like a very lucky escape Mike. Good to hear your safety system worked well and kepy you out of harm’s way.